We make commitments in moments of crisis; in moments of sudden insights; in a flash of compassion evoked by an image of a stranger struck by tragedy. This is my eighth year of bowing for what I have come to call my 9/11 Bowing Project. I have kept my promise (to myself), to bow in a public place on the 11th of each month since 2007 My agreement was to bow on the 11th, or if that was not possible, to make up for the missed day by bowing before the end of that month. This month I came very close to breaking my word. No one would’ve known or cared. I could’ve offered countless perfectly reasonable arguments for skipping the month and maybe even letting this whole project slide. But here is what I’m up against. Whoever else I am, I’m also a peace worker. A self-employed peace worker. 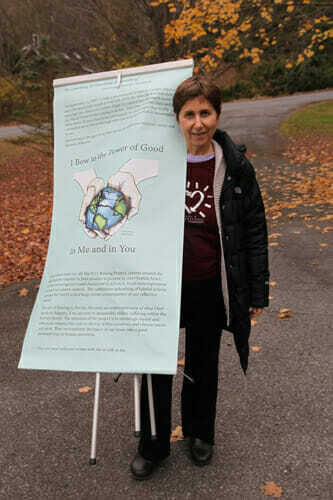 My peace worker Self assists with my passion for the fertility work I do, my parenting, my marriage, my friendships. There is less and less doubt in my heart, that that’s who I am. Perhaps the purest of all desires I’ve nurtured for as long as I can remember, has been the desire to diminish suffering caused by human hand. 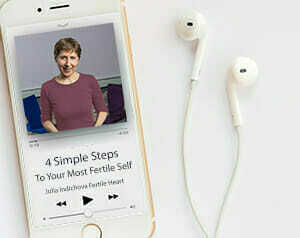 Astonishingly, the Fertile Heart OVUM practice has evolved into an effective tool for that work. My commitment to bow, keeps me connected to that vision. This peace project has a life of its own. I have no idea how it will unfold. I may or may not continue to bow. But when I decide that it’s time to stop, I hope to do so as an adult, rather than a tired schoolgirl that would rather not bother with homework. We make a commitment to enter a certain kind of relationship. Our commitments set the groundwork for the nature of that relationship. If we can lovingly observe our behavior against the background of a promise, we get to know ourselves and the value of our relationships. Our relationship with ourselves and each other. Our relationship with our deepest personal and collective longings. Commitments keep us connected to the object of our desire. Which makes me realize that what I said at the beginning of this post isn’t true. I did not just make the promise to follow through with this project, to myself alone. I gave my word to Peace. Because I want to show Her that I’m on her side. That I’m willing to speak up for Her. Yes, the first and last think you and I need is a commitment. A decision to be someone we can count on. Having one or two people like that in our lives can make all the difference. Any surprising f*ck you Orphans or unexpected Visionaries showing up for you? Could you embrace them all; hold them close without judging and guilt-tripping yourself? Could you simply see and love them for who they are. Children looking for a Mom like you! What a beautiful post – my guilty orphans are doing summersaults!! I seem to manage to show commitment to everyone but myself. I look after everyone else and leave myself until last. The is unsustainable but I have filled my life with so many commitments to others, that I do not have time for myself. It is wonderful to me that I can see this with such clarity and I am grateful for that. I believe that the lack of time for myself is a fear of facing or hoping that I could have what I desire – am I worthy? Openhearted -Yay for commitment to pray. I’m sorry to hear of your daughter’s school challenges. Hopefully it is mild compared to things related to my daughter. Brave Caterpillar – 2 good things for your body a day sounds great. I have been doing Riding the Current of Creation Fertile Heart body truth (some of it) and Palace of Truth (changed to body kindness) Fertile Heart Imagery (imagery II. I feel like my daughter has challenges keeping her word on studying (a D and an F already) and I have challenges keeping my word on caring for myself, so we are not so different after all. I’m sort of meditating on that right now. i can see (or I think I can see) what my daughter needs to do, since I’m on the outside, but for me the voices keep saying you better get this done first or this side track will only take a few minutes (this morning a few minutes turned into an hour). These past two blog posts and all the comments have really struck a chord with me. For the past four months I’ve had a whole orphanage of f*ck you orphans, whom I’ve allowed to take hold of the steering wheel from the moment I wake up and grumpily make my green juice, to the moment I collapse into bed after half heartedly doing my fertile heart practice on a good day! It’s exhausting living like this! And I know that I gently need to take hold of the wheel again. Not too long after reading these posts one evening after work I just lay down, and allowed myself to just think and be honest about what I am so afraid of, and lots came up (which I won’t fully write about here), along with a whole load of tears. One of the deep feelings, which I am sure others will relate to is that I am so tired of chasing the baby I should have had yesterday. I want to feel free to move again with all of me, as since this journey began I’ve allowed so many parts of my life to collapse around my ears, because I’ve imposed so many arbitrary rules on myself (so many of which I can’t even remember where I read or who said!!!). It was a deep feeling that the path to our child means allowing myself to be free to do some things that may not seem to have an obvious connection, but that are more instinctive. To let go of what didn’t happen so that something new and beautiful and quite frankly terrifying might! Another reflection was that this is a time of transition for my husband and I (with his new job starting soon) and I am always so apt to allow circumstances to overwhelm me and postpone what is important to me until x,y and z is sorted. But I realized that this time I need to move with and through the changes. So I have made some new commitments since reading these 2 blog posts. The image of slow dancing with life was so profound for me, so I have bought some new music, just for me, Gambian harp music that I love! I have got up early every morning for two weeks and made time to stretch. I have committed to spending Christmas with my family in Wales, to get some long overdue cuddles with my nephew and niece that I need, and booked my plane ticket. And I’ve admitted I don’t like jogging to keep fit, and been swimming for the first time in years which I love (someone somewhere at some point in my ivf said I shouldn’t because of the chemicals, so I didn’t for far too long!!!). I have found a lovely pool and I can’t tell you how free I felt in the water swimming for the first time in maybe 6 years!!! And life has shown me this is the right way, some new doors have opened and totally unexpected opportunities to grow and learn have come my way in the past 10 days. It is a struggle every day to let go of the micro managing of the baby I should have had, and let go and jump into the fear of the mystery of what could be, but this community really does help me with that everyday, even (especially!) on the really awful hard days. My f*ck you orphans are still very strong, but that’s because what they have to say is important! I’m feeling much more energetic since I got the all-healthy report from my doc (mammogram, ultrasounds, blood, Pap, etc.). My anxiety roots itself very deeply in health issues, so I feel much better knowing it was my fear orphan talking to me and not anything real happening in my body. So now I feel stronger and able to commit even more to the practice. Before, my orphans were whispering “Why try? Why practice? You know you’ll be dealing with chemo and surgery and all that instead of a baby, so you’re wasting your time.” I faced my fear, took the tests and now feel like I can breathe again. Anxiety bites! I am working on Mirror of Truth and Unconditional Gratitude. I’m due for an imagery change this week, so we’ll see what feels right. I am hoping to work on creating about 30 minutes or quiet time each evening for me, where I can write, do imagery, practice Body Truth and try to meditate. I still battle anxiety daily, so this tiny window of time will help me manage that better, I’m sure. For my kiddo blessings…..1.) My son showing off his Batman watch to the police officers at a Sept. 11 memorial we attended (I thought of you, Julia, and your bowing project. Our neighborhood has a house that sets up an entire memorial in the front yard, complete with tiny flags naming every single victim in the Sept. 11 tragedy. He has also included names of those who have passed away since that day due to the effects of the toxins or injuries sustained in the attack. It’s beyond moving. So my son and I stopped by as everyone had a moment of silence and then bagpipes played. I prayed for the world to not be so heartless, and to embrace peace.) 2.) My daughter playing Legos with her little brother and always being so patient with him. 3.) Watching my son follow his big sister everywhere, and knowing she loves that. 4.) And buying them cheap shaving cream at Target and letting them go to town in the tub last night. Two bottles of shaving cream meant an hour of fun while I made dinner. Who knew kids could have so much fun with shaving cream?! Oh commitments. I have been doing my absolute best to do imagery at least once a day right now. If I don’t I find my orphan saying look you slipped up again you might as well give up because you can not do it right anyway. I have found this orphan a lot lately as my daughter started school and is struggling. I want her to succeed so bad and get things only because I see so much of my own struggle at her age(I had reading issues/still not the best reader/writer) and it brings up my own orphans of the past the one that says just give up it is to hard! I find I am trying my best to love where we are right now. I also do not want to push her to hard or myself as if we are over committing ourselves. This makes me feel anxious and out of whack! If I do not say yes to some commitments I find I am not nice enough, helpful enough, etc. On a good note the last two weeks I have also committed to sit quietly and pray helps me feel connected and balanced. I am still running too. I have done this at least 3 times a week since April. Thank you Julia for this post, it has given me a lot to think of these days, and thank you to all of you for sharing your commitments, it nourishes me to read your thoughts and experiences. I have thought a lot about my journey since we decided to start trying to conceive. I started writing about it and haven’t finished but what I realized so far is that everything I have started I haven’t finished or haven’t been constant with it. Now I realize that I have this orphan who is judging me saying everything I have done is wrong, that there is something wrong with me or with what I am doing and that I have to keep looking to find out what it is and solve it, do it right. If I think about it, I did do many good things for me so far. I stopped drinking coffee, switched to black tea, then green tea, then decaffeinated green tea. This was huge for me since I love coffee. I eat almost none dairy products, I sometimes cave in because I love cheese but I try not to because I feel better. I stopped having dessert after dinner, and when I crave sugar I try to eat a fruit. I also lowered my consumption of white flour. But I still buy milk, cookies, and cheese for my husband, which made me think that if I really thought I was changing all these eating habits because it was good for my body I would not buy anything to my husband because I love him and I want him to be healthy too. Could it be that I want to punish myself because deep down I feel all of this is my fault? He still deserves to have all that good stuff. So what I thought my commitment could be is to write down each day two good things I did for my body. If I do this it could help me realize what I am doing to care for myself but also that it is a positive change not a punishment, it could help me to change my mindset. If I really believe that I deserve to be cared of, that I deserve to feel good and healthy, I could start to believe I also deserve to be a mother. I remember you said in one of your books (I am paraphrasing) I need to show my body that I can be relied on, I want to do the same thing too. (This is Robin) Thank you all so much for being here! Julia – Thank you for being supportive of my journey. ButterflyFaith – I like the purple hair. I love the question how to bring lessons to daily life! Great insights about mothering the third child already here. Heather – Wonderful to hear from you!! gutsymamma – Wonderful vision of preparing your baby’s room. Sofi – I can relate to having more trouble keeping commitments to my self than to others. I have been doing Riding the Current of Creation Fertile Heart Body Truth and Palace of Body Kindness Fertile Heart imagery (Modified Imagery II Palace of Truth). I have at least been more aware of my body and being kind to it this last week. Like sometimes when I’m frustrated at a stoplight I will massage my shoulders while I am waiting. I believe that I get thrown off course by my daughter’s challenges – she’s had some bumps including as of today failing a class, and I find it hard to bring the attention back to me. But at the same time I know we’ve been down the path before and I need to pull back and care for myself so I can be in a more visionary place. We were out kayaking in some beautiful scenery last Sunday and it was wonderful to do that. Such a blessing that everything worked out and beautiful weather, even seeing some elk. How great is that? It’s 109 degrees here today and I am seriously melting! Cranky, worn out, melting. So the heat has made me completely toss aside my good eating habits (shave ice for lunch!) and exercise (the idea of breathing in this heat makes me cry), but I’m trying not to get too down on myself. I realized I am really, really dedicated to birthing my next Visionary self, but there’s a problem. I compartmentalize everything. When I’m in therapy, I really do therapy and I “get it.” But when I leave, I don’t take my lessons with me. When I practice FH on our calls every other week, I am so tuned in it’s awesome. But after I hang up and the buzz wears off, I find myself forgetting to actually walk the talk. Again, I’m just like my students who show up to class but then never crack open the book or read their notes once they leave my classroom. So now I need to figure out how to bring these lessons into my daily life and not just during the appointed times I set aside to work on them exclusively. So for my kiddo blessing….Today the kids insisted I take pictures of their Technicolor tongues, thanks to shave ice. And my son grabbing my hand and leading me to the bedroom so he could show me the picture of himself he just drew. With purple hair because “they don’t make blonde crayons.” ha ha. I think the commitment I am working on at this place in my life is to take things one step at a time and be thoughtful in my journey. I have a lot of on my plate right now and as I told my mom yesterday, I need to slow down and breathe. Two of my favorite imagery exercises is Fork in the Road and meeting your child halfway. I think I connect with them because they remind me on a deeply visceral level that I am on a journey through life in all ways. Thinking more on this topic of commitment has brought up a lot of new ideas, insights and emotions. I commit to lots of things, but sometimes I only commit mentally, not physically. Words, not actions. I am very stubborn, so once I set my mind to something, it’s tough to change it. I do make physical commitments (food, exercise) quite easily, but when it comes time to doing things for my mental or emotional health, I just write them down in my to-do list and then blow them off. Why? What is that about? So I’m going to make a commitment to try ONE thing that my UM shows me in my imagery. Such as starting that blog, or writing more for me and not for deadlines. And I will keep up my commitment to count my blessings here. Such as yesterday’s treasure: I was leaving yoga class and my husband was bringing my kids around the corner after picking them up from the kids’ club. They both yelled “Mom!” and came running at me as if they hadn’t seem me in days instead of just an hour. Made me so happy to get huge hugs from them both. I felt like the prom queen. My committment is to keep walking towards my child and when I feel the need to judge my orphans or be hard on myself to remember that is what they need. Attention and care from the V and UM. The other day I cleaned out an empty room in our house. We moved into our house 4 years ago and until the other day we had boxes of things left unpacked in this room. This room was to be our “child”s room and b/c of past heartache and length of time it is taking us to conceive – we just literally have done nothing with it. I decided the other day to clean it up. My husband awhile ago bought me a rocking chair. So I moved that rocking chair over to a window that over looks our beautitful 3 acres in the back of our yard. My grandmother who passed away a few years ago had left me this old beautiful side table with marble toping. My “f.ck you” orphans are telling me that the nest remained empty because my son left home for going to university. Of course, they pop up every time I here that somebody that I know is pregnant after 40. My last bleeding was late which means that I’m not ovulating every month, so here it is another occasion for meeting my “your body is not helping you” orphans. Thank you Julia for this thought-provoking blog and to all the other mamas whose posts are so inspiring. I am often intimidated by everyone’s eloquence and that stops me from writing, but I am trying to break out of my shell. The topic of commitment definitely triggers some orphans, who mostly feel that making new commitments will trap me/them and take up so much time that there is none left for me. So I hesitate a lot when something that looks like a commitment presents itself, because I do take them seriously and want to be a person to keeps promises and commitments, especially to other people. I have realized two things this week around this topic. One is that I have a lot more trouble keeping commitments to myself than to other people. Like simple health behaviors, I like them slide like they are too much trouble to do. I hate to exercise and I have not been dancing or doing yoga which I used to love to do, and it is really showing with extra pounds and weight. And yet, I use the time excuse, I just don’t have time for it any longer. But there is a commitment that I made to myself over 20 years ago that I have stuck with which is my vegetarian diet. Two years ago I became a vegan and that has been another level of commitment. Once I committed to being a vegan, that was it and I have stuck with it. It’s been an incredible challenge socially and even in this fertility work, as everyone from the RE to my acupuncturist has said that it affects fertility. But I feel strongly that this is my contribution to peace and reducing suffering in the world, to eat compassionately. And it has become a lifestyle too, now clothes and shoes are animal-free, and I even chose a new car recently because it did not come with leather seats by default. I have found that this is something I have to recommit to at every single meal, especially when faced with choices that are less than ideal for me or where no one else would know the difference. Having a child/becoming a mother is another huge commitment. The thought of it used to terrify me, especially when I saw how several friends’ lives changed after motherhood. This fear or hesitation could be part of my fertility challenge, that even though my mind and heart are ready, some orphans might not be. I still need to think more about what fertility-friendly, visionary-rooted commitment I can make to myself that would be supportive for this journey. One possibility is to commit to taking more time off from work to give myself a break from the stress. I have been very jealous of people’s summer vacations, and originally planned to take one this week but gave it up for various reasons, but decided to at least take today off. I still worked for a few hours because of deadlines. Now I am looking at the first week of November for a real getaway. I have the time off accrued, so I need to do it as a matter of self-care. I am considering taking 1 to 2 PTO days off a month in addition to longer vacations to see if it helps with my stress level and health. On another note, I have been doing 9 Hearts for imagery this week, and I find it very comforting. Thanks for the great call on Monday, always so much to learn from everyone. I’m working on keeping my anxiety at bay. I’m like a pinball of panic and fear. If I’m not worried about getting pregnant, I’m worried about my health or my children or my husband. Anxiety is just plain evil. I’ve had lots of experience with depression, yet anxiety always kicks me on the face. I read a post about someone waiting for his third child to be born. He talked all about his excitement to be a new parent one last time, to fall in love one more time, to feel that joy one more time. It was as if I wrote that. Except his wife is 39 weeks pregnant and I just finished my period. Ouch. So on to better thoughts. Today I was walking with my son and he stopped to pick up a dandelion. “What did you wish for,” I asked when he blew the fluff away. “Christmas!” And he laughed. That kid. You already have a third child, dear K.! And she has so many care takers, teachers, protectors. So many people to worry about her. But she’s waiting for her Mama to come home. She’s waiting for her Mama to fall in love with HER. She’s waiting for someone to be excited about being “her new parent,” to discover how precious and adorable she is; how abandoned she’s been and how much she longs for someone to hold her in a steady enough embrace when her despair drives her to “kick Mommy in the face.” Give her a hug for me, will you? I don’t know if or how that other unborn child you long for shows up. But I do know that she can’t take on the mothering of that kicking, wailing, waiting kid. Thank you for the dandelion moment. Such a thrill you give us to share these pictures of delight with your boy. Delicious! Keep them coming! Whoa, thanks Julia! That’s a totally different way of looking at this. I like it. I mean, I don’t like that I’m ignoring this already-here third child, but I do like that there may be something new I can focus on to try and move around this roadblock staring me in the face right now. I know I want to stuff the orphans away whenever I uncover them. I want them to go away. I don’t want to love them up and hold them. I want to punish them for being so disobedient and stubborn. But, as my mom used to say in her best Dr. Phil impersonation, “How’s that working for you?” Maybe I need to treat these orphans with more kindness and mother them better instead of acting as if they were criminals finally caught and in need of punishment. Thank you for the constant support and love, Julia. I know I need and appreciate that so much, as I’m sure all the mamas here do, too. And maybe if I look at myself at this unloved and ignored third child in need of a mom and some mothering, AND I did something about it, I may turn a corner. I always look at myself as something that needs to be fixed, cured, bettered, tolerated. Something broken, old, misguided, mistaken, toxic and wrong. I most certainly DO NOT treat myself the way I treat my children nor do I see myself at all the way I see my children. So now I need to figure out how I switch that and start treating this third child/me as someone worthy of mothering and love. Hmmm. Insight all around today. Julia – A lot of ideas came to me related to FertileHeartedHuman – If you want me to email them to you, please let me know. I wasn’t sure it would work here?? findingfiath21 – Wonderful happy blessing moment. Mother2Be – Wonderful commitment to slow down. InThisMoment – Yay loving and caring for orphans. Warrior beagle – Fantastic anniversary sentiments and what wonderful love from your husband! (This is Robin) So I was at a religious meeting for my religion with some youth – someone else was in charge of this meeting. They were thinking of doing a service project and were considering this video as an inspiration point so I am including it here. Maybe what promotes peace is everyone loving/respecting one another. I wanted to commit to body kindness 5 minutes a day or maybe getting to bed by 11 a certain number of days in the week (7 hasn’t happened yet ) I take commitments seriously and try to do my utmost to fulfill them, so I don’t take commitment lightly Then my daughter had a very challenging time starting Tuesday afternoon where she internalized some bullying behavior directed towards her instead of seeking appropriate justice, so here I am up until 3 am Tuesday and helping with this situation for a good part of Wednesday. But I am grateful it has been a long time since she’s had this much challenge. Today I am back in the game. I did at least get to bed by 11 last night!! Heavenly. I have been doing Palace of Body Kindness (modified Fertile Heart Imagery II Palace of Truth) and continuing with some of Riding the Current of Creation. Glad to hear you’re “back in the game” Robin! Body kindness and Riding the Current of Creation sounds lovely! Thank you, i’m always open to suggestions, right now I have quite a few projects on my to do list, one of which is to complete my Bowing Project related book. Give a hug to your daughter for me, she is lucky to have an ally like you! Oh man! The call last night was remarkable. I was shocked at the orphans who popped out when we were doing the “living dream” of running the race. Mine were mean, bullying orphans who were like these “I told you so” jerks. I learn so very much at every single call. It’s just incredible. I also realized that I need to stop apologizing for wanting more children. I feel so guilty and undeserving for wanting more, for trying to have just one more. But maybe I should see that orphan and love her up, and accept that I want more children because I feel a longing for more. And that’s OK. I love being a mom so much it shocks me. Why wouldn’t I want to expand that love to more children? Perhaps my guilt at wanting more kids is blocking my fertility. Maybe deep down I don’t feel I deserve any more, so that’s keeping me from having more. This FH work is always peeling back my layers, making me examine things on levels I didn’t even realize were there. As I promised Julia, here is my happy blessing moment with my kids today: Looking at my son’s curls, damp from sleep, as he dreams tonight. Great work on the call last night, mamas. I love connecting with you all. I’m feeling a bit better after all that work Monday. Oh, K. This “here is my happy blessing moment with my kids today: Looking at my son’s curls, damp from sleep, as he dreams tonight” sends shivers down my back and moves me to tears. And…thank you for letting me know that the calls are meaningful for you, I can’t do this work without good company. You and this amazing circle of women are very, very good company. I’m so grateful to each of you! Thank you, Julia! If only I could post a pic of those curls. This little boy melts me. And I am so very, very grateful for you! Commitments are all too familiar. I seem to make far too many of them and in doing so fail to meet my expectations on many of them. My orphans scream f*ck you just about every time I commit to something. They don’t want another thing to take attention away from them. I’m beginning to think that I make all these commitments so that I’m too busy to communicate with and listen to my UM. Perhaps slowing down and making time for that would turn the orphans into visionaries. So a new and completely different commitment . . . I commit to slowing down and spending time with myself. Scary! Thank you Julia for another thought provoking blog. One of the commitments that I have recently made is to reach out to the people of Lesbos in Greece to help with the influx of refugees that have landed there. After reading the article posted on the Fertile Heart facebook page, I felt deeply moved to do something, to help in some way. I gathered up supplies from around my house and I also asked my coworkers for donations. I now have a huge pile of clothes, shoes, blankets, feminine hygiene products, and toothbrushes/toothpaste (I work in a dental office) to send over. People even donated money to help with the shipping costs. I can’t imagine what the inhabitants of Lesbos are going through, nor can I fathom what the refugees are and have had to endure in their struggles. One thing that I can say for sure though is that I am truly blessed and have so much abundance in my life. The contrast is frightening. I am living in the Land of Haves, each and every day. I am committed to sending over to Lesbos 1-2 large boxes of supplies each week for the next month to help with the refugees. Oh, lots of people will be blessing you, J.! Wow.. Julia, always getting me to dig deep and see things from a different perspective. I don’t think about the word commitment too much. I don’t know where my commitments lie at the moment. Your question of the “f*ck you orphans” that show up really opened my eyes to my own that squeal with fear when I research or think about embryo donation or God forbid – adoption. These orphans are so exhausted and frightened that they keep pulling me back to orphan reality. Maybe I need to commit to my orphans first – to love them, care for them and acknowledge them before I commit to my next step? When in doubt, love your Orphans…sounds good to me,L. I wanted to share something that happened on my 11th anniversary week that made very clear that my husband and I are committed to each other….for the right reasons. It’s obviously been a rough couple of years, as we’ve been struggling to start a family. And I always very heavily feel the weight of the guilt and fault orphans. That tell me (and him) that he could go out and find a younger, perfectly fertile young woman and have a family tomorrow. Which he always responds to by saying…no, I want you. Which is nice to hear, but my orphans somehow don’t want to fully believe him. This year, we had a crazy whirlwind week, with some friends in town that I organized some NYC sightseeing for, anniversary dinner, etc. the friends brought him some things from where they are from that made my husband thrilled. When we got to our anniversary, I realized (and wrote iny card to him) that what makes me happiest is to see him really happy. And he got me three cards that said the words beautiful and amazing (regardless of whether we have kids right now) so many times and ways, I knew he meant it. He also reminisced about when he proposed….saying that he knew he had to scoop me up….because I wouldn’t be around long and he’d regret it forever. I asked him if he had any regrets, knowing what he knew now and he said….absolutely not. Much healing. And 100 percent commitment. Thank you for giving me space to write this Julia. “When we got to our anniversary, I realized (and wrote iny card to him) that what makes me happiest is to see him really happy.” Gorgeous! We find out who we’re married to on this journey that’s for sure! Thank you for this! Thanks for this Julia. Yes, we certainly do. I love how you don’t stop doing what you know helps YOU even if, as you say, no one would know or mind if you stopped. You keep doing it. I admire that. I wish I had that same conviction! I keep showing up for my fertility practice, but instead of enriching me, it drains me. I wonder why I do it because it doesn’t seem to make a difference and if I stopped, who would know or even care? Every month I build myself up, I try to bow to what is, I start to believe, and every month I’m slapped back down and have to claw and scratch my way to the surface yet again. In the front of my mind is the thought, “Well, what did you expect? You are 44.” I keep getting these signs and dreams that I’m on the right path, but nothing in reality actually changes. How do you keep the strength to keep going, keep bowing? I am so very tired of being so sad and beaten up. When do we know it’s time to let go and move on?